Do you feel it? It's like something magical is in the air. From that tinkly jingle that lightens the heart as the familiar notes float from every corner, to the wider, more merry smiles on the faces of people we meet. And somehow, be they children or adults, there is a palpable sense of growing wonder and anticipation, as the year end draws near. It's like the whole world is settling into a happier, more relaxed mode, with the arrival of that gorgeous season finale of the year -- Christmas! So don't be surprised if you hear us at Juice Works humming along, or if you see a smile teasing our lips when we mix up your drinks. And in conjunction with this merry season, we've whipped up a special, sparkly red drink! To us, it epitomises all the goodness, happiness and sweet excitement this time of year brings. We hope the very name itself sends a happy tingle, for we're calling it 'Honey, it's Christmas!' An icy smoothie mixed with the juices of honey dew, plum, strawberries, lemon, and the seasonal additions of dried mulberry and ruby-red pomegranate juice, this little concoction is only available from Nov 6, right up till Jan 1, 2018! Dried mulberries, which have a naturally sweet flavor with no added sugar, also provide unusually high levels of protein and iron for a fruit. It is a rich source of vitamin C, fibre, calcium, and antioxidants. That's why dried mulberries is delicious as a snack, or mixed in yogurt, smoothies, and more. Pomegranate and its distinctive jewel-like seeds have been used for medicinal purposes for thousands of years. With higher levels of antioxidants than most other fruit juices, it also has three times more antioxidants than red wine and green tea. As such, this Middle Eastern fruit is claimed to be effective against heart disease, high blood pressure, inflammation and some cancers, including prostate cancer. Honey dew has high water content and potassium levels, which make it a great fruit for maintaining healthy bloodp ressure levels. As it contains both vitamin C and copper, it also promotes healthy skin by aiding collagen production and tissue repair. To further boost that vitamin C-o-meter, lemon juice is added too, for that balancing taste of citrus, to help with digestion and to keep the immune system at optimum levels. As for strawberries, it is chockful of fibre, folate, and antioxidants like vitamin C and phytochemicals to help reduce cholesterol in the arteries and vessels. It is also rich in iodine to help regulate the proper functions of the brain and nervous system, on top of having high doses of potassium per berry, which is great for concentration and memory. As you can tell by now, this smoothie combination has truly been painstakingly crafted to help you ward off sickness during the celebrations, reduce cholesterol while you indulge, and to keep you well-hydrated, with healthy and pretty skin! So while you party the year end away and celebrate the coming of the new year, don't forget to drink up! 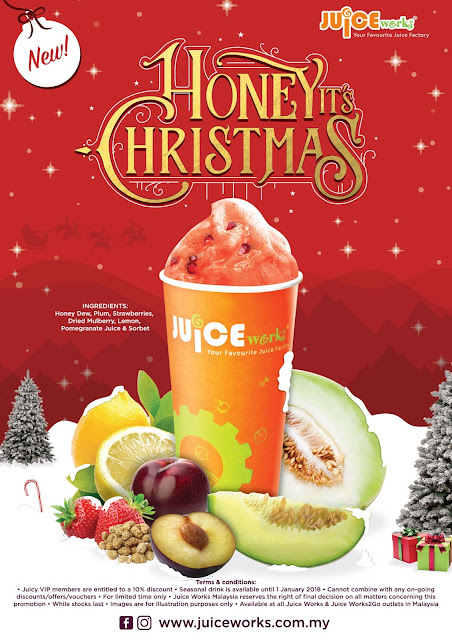 And from all of us at Juice Works: Have a healthy, merry Christmas and an exciting New Year!! !